Boarding the fast train TGV at Paris we swoop over to Alsace. At Colmar, walk around the beautiful mediaeval city and then on to the wonderful fairytale town of Eguisheim to meet the Baur family. Longtime winegrowers in Eguisheim, they began their own winemaking some four generations ago. Three very fine vineyards; Eichberg and Pfirsichberg around the town, and Brand on completely different granitic hill soils near Turkheim, provide the best of three microclimates to make their stunning wines. Their crémant or sparkling has won best Cremant of France by a Gold Medal in the Concours de Paris, an array of medals for their other wines also. Further north – Selestat, another settlement of Alsace well worth seeing on foot. Visit magnificent Cathedral , synagogues and a curious old Secular Library. Our wines from nearby Scherwiller , by the family of Frey -Sohler , are superb with the enticing Franco-Germanic food of Alsace, equally with the Asian inspired dishes of Australia. Now back west via Paris to the world famous estuary of Bordeaux where Garonne and Dordogne rivers swirl into the Atlantic in a surprisingly wide mass of water seen from many vantage points on the right bank such as Cotes de Bourg. The elegant wines of Monsieur Christian Bernier, the Châteaux Font Guilhem and Conilh – delicate reds from Merlot, Cabernet Sauvignon and Cabernet Franc. The whites are varying combinations of Sauvignon Blanc, Semillon, plus Muscadelle for a touch of aroma. Compare these with the wines of Travers, another family enterprise in Canon Fronsac who make the august Chateau Belloy and many other wines for us. We have also from Graves, St Emilion, Lalande de Pomerol and other areas of Bordeaux some exciting petits châteaux so delicious with food. Organic wines poetically made at Château Miaudoux in Bergerac, a short ride from Bordeaux but using Bordeaux varietals in the main. Picturesque green countryside, and many wine related activities for visitors. Roman settlement is very evident, so you know Bergerac has been making wine a long, long time! 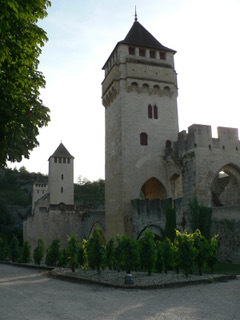 South east of Bordeaux , south of Bergerac, distinctly inland and of the south into Cahors, mediaeval city home to Vin Noir, the dark wine made principally of Malbec. We could not believe how beautiful these wines were until we tasted them carefully and quietly at the dinner table. Now we have more labels of Cahors than most other suppliers in Australia. Châteaux Paillas, Saint Sernin, Armandière,Eugénie, Cessac, Crozes de Pys, Troteligotte. You can choose no more velvety and fascinating wine when you want a change either from Bordeaux or from Australian cabernet blends. From the Côtes du Rhône we have Château de Manissy’s white, red and rosé, all most flavoursome, The Beaume de Venises of a connected vineyard, and various other wines of that ancestral home of syrah(shiraz) , grenache and mourvedre. Please try them – they are a very important part of the world heritage of wine. Clockwise we turn- Beaujolais from Chavet in Macon, and the red and white Burgundy of Ferrey Montangerand and its very fine crémant, half the price of Champagne but eminently sippable. Most of the major varietals we know so well in Australia, have their home in France. The comparisons over dinner will fascinate and keep you and your friends talking about old world and new world and whether the twain shall meet. It does not actually matter, for there are many friends on the Route du Vin who admire and respect each other and love the experience of sampling wine in all parts of the world. 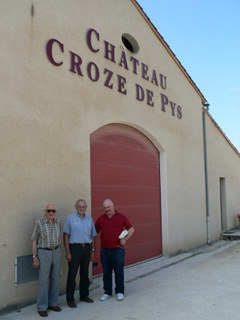 Another Bardwell Park Cellars customer recently visited Beaujolais with his wife and tasted the wines we import, at Chateau de Pizay. 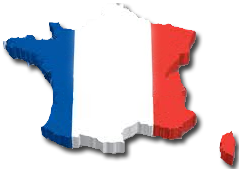 We can arrange introductions for you also if you are travelling to the wine districts of France. Please give us as much notice as you can! Varietal:- 70% Merlot, 10% Malbec, 10% Cabernet Sauvignon and 10% Cabernet Franc. Taste: – Located in the commune of Pellegrue, this lovely property produces wine true to the Bordelais heritage. Intense fruit and tannins round and structured all in a very refined wine. For all grilled or roasted meats; especially for pork cuts, roast chicken, grilled beef and white cheeses. Taste: – The colour of black cherries, and a tannic persistence in the palate, tastes of red fruits with vanilla. Very nice with barbequed beef. A good initial mouth feel with strong food-friendly tannins. Taste: – Very aromatic nose, lightly spicy red from the home vineyards of M Christian Bernier in Bourg above Gironde estuary. Very balanced wine with some keeping prospects for the short term. Awards: Médaille d’Argent and Médaille de Bronze, Récompenses Européennes Show. Taste: – Balanced. Supple, and soft, sweet white wine ideal for a cheese platter leading from the main course to the puddings. Very popular with our customers ever since it arrived. Taste:- Typically Haut-Medoc, this wine has complex aromas of red and black berries, as well as liquorice, and, slightly menthol and spicy aromas. Aged in oak barrels, it offers elegant and pleasant woody aromas. As it ages, it develops wonderful bouquets of animal aromas (leather, fur), roasted aromas (mocha), prune, cedar, and truffle. This wine is lively, bright, generous and powerful, but never overpowering. Taste:- Colour beautiful, deep and of high density; nose very expressive. Taste is more complex, with notes of prune and camphor. This wine can be drunk now but also as the years pass. For red meats, game or cheeses and cheese based dishes. It perfectly accompanies a confit of duck, cassoulet, or a mushroom stew. Taste:-Relatively dark with pleasing ruby-red highlights and a slightly amber-coloured rim. Intense red fruit bouquet of Cabernet Franc as well as tobacco leaf overtones typical of 2007 Merlot. Delicate on the palate , good tannin that is not dry, just the right amount of acidity on the finish. Plenty of finesse and well-integrated oak on the aftertaste. Taste:- Complex, with scents of lime and passionfruit which are also present in mouth, both in its intensity and freshness. For goat and washed rind cheeses, fish, fruits de mer and poultry. Taste:- This botrytised dessert wine has an elegant style, with discreet floral touches and a soft palate with complex crystallised fruit (mangos, dates and dried apricots).Drink between 16° and 18°.Delicious aperitif, it will go well with white meat, ewe’s cheese and fruit tart. This wine has won Golden Magnum Concours de Bordeaux in 1999 and 2003. The Golden Magnum is awarded to the winemaker with the most medals for the past 5 years at the Concours de Bordeaux Vins d’Aquitaine. Average age of the vines is sixty years. Taste:- Attractive green pale colour. A young and lively wine, crisp and racy, with lovely grapefruit and honeyed melons. Clean and fresh on the finish. Excellent with seafood platter or simply by the glass. Taste:- This is a dry, lively and vibrant rosé with crisp cranberry and strawberry sorbet flavours. Excellent with a salad, or sardines or chicken tandoori barbequed on the terrace. Taste:- Beautiful dark red colour. Lovely and fruity, offering loads of spicy strawberry, black cherry and liquorice flavours. Excellent with veal, chicken or simply by the glass on its own. Taste:- Bright light golden colour. Pretty aromas of honey and apple blossom. Tropical notes of peach and guava on the palate with a touch of spice. Clean and fresh on the finish. Excellent with a warm fruit dessert, cheese platter or simply by the glass. Taste:- The clay-limestone soil provides ideal conditions for growing Merlot. Displays beautiful harmony, this wine combines the delicacy of mature fruits, a silky texture with aromas of jam and spice. Taste:- Beautiful mixture of red and black fruits aromas. Notes of plums, violets, sweet spices and leather. Soft and silky mouth. Hints of mint and chocolate. An entrancing wine from the first eye contact! Taste:- On the nose, the wine sets the tone directly to the range of aromas already complex. Notes of liquorice, brown tobacco, violet, Burlat cherry, plum, cassis, currant jelly, wild strawberries and raspberries. With aeration, the wine takes on hints of pepper and mineral aromas. On the palate, the Merlot bursts on a velvety, smooth and fruity material. Taste:- The wine colour is brilliant and sensational, and the magic of colours creates a vibration of the gold and the red. A bouquet which mixes scents of precious wood – oak, cedar, sandalwood . In mouth, penetrating smoothness with a subtle sweetness where the softness matches harmoniously with the rich tannins. Taste:- Beautiful wine with nice structure, soft and fruity.To taste with cooked pork, white meat and fish. Varietal:- 85% Sémillon, 12% Sauvignon, 3% Muscadelle. Taste:- A beautiful golden yellow colour. The bouquet is subtle, with a good intensity and elegant notes of apricots and pears. There is a lot of roundness on the palate, well-balanced tannins with fruity and honeyed flavours. To be served as an aperitif with foie gras or melon, or later with blue cheese, puddings and ice creams. Taste:- To the eye, bright yellow with golden reflections. On the nose, notes of honey and dried fruit in the mouth, finesse and elegance in its roundness. Fine bubbles that provide a crisp and fresh sensation. Small flowers of lilac and white jasmine, prolong the moment of tasting, leaving a longer enjoyment. Taste:- A sparkling rosé with bright reflections. On the nose, hints of strawberry, candied red fruits, in the mouth it is overwhelming with elegance and joy! The bubbles are gentle and tickle the palate. A delicious Rosé which promises party atmosphere and conviviality. Taste:- An immensely drinkable Bordeaux with smart « Veuve » coloured tangerine label. Smooth, structured and displaying all the characteristics of excellent Medoc for the price . Drink with a roast, with a variety of cheeses, hard yellow, camembert, chèvre or else a cassoulet. Taste:- A most smooth and harmonious red wine, abundant fruit and some dry tannins, from Graves, the perfect terroir especially in an year like 2010. Excellent with entrecote of beef scored with fresh shallots, or a dish dominated by mushrooms and strong cheese. Taste:-A deep yellow colour with vivid flashes of light. The scent is both floral and its palate contains rich tastes of apricot and papaya, round and fresh. To be served with foie gras , as an aperitif, but also complements white meats and desserts. Taste:- An elegant wine, produced in the same neighbourhood as various Grands Crus Classés. The colour is deep purple and intense. Nose of red berry fruits. Rounded mouthfeel and delightful long aftertaste. Taste:- An exclusive wine from the family vineyard of M Faugier in the Crozes Hermitage area of the upper Rhone. With violets and roses and other rich delicate smells and tastes, this is one of the nicest red wines in our offerings. Made for a lovely white cheese, camembert, brie, Chaource, Comte, or a meat dish with mushrooms. Varietal:- 70% Grenache and 30% Syrah. Taste:- 6 months in concrete tank, deep garnet colour with violet tinges. Bouquet of black cherries and blackberries and soft tannins. Red meat, tomato sauces and roast vegetables. Ready for drinking. Taste:- Low cropping vines. Maturation without oak. Cherries and red berries on nose and mouth, well balance between tannins, acidity and alcohol. Turkey roasted with thyme and rosemary and vegetables, other white grilled meats and medium flavoured cheeses. Drink now. Taste:- Fermentation and 12 months storage in barriques. Bouquet of flowers and dark ripe fruits in the mouth, vinous but finely balance, silky tannins and exceptional length. Meat with spicy sauces such as Filet Mignon with green pepper sauce. 10 years’ aging potential. Taste:- Vines grown on pebbly soil with low yields. Run by the family Favier and praised by leading wine writers. Manually harvesting and fermentation for 21 days at low temperature, no malolactic. Very fragrant aromas of almond and peach blossom, palate smooth with exotic fruits and fresh pineapple. Fish biriyani, Thai fish, mild dishes & grilled prawns, salmon and rice or simply as an aperitif. May be aged up to 15 years. Varietal:- 70% Grenache, 20% Syrah and 10% Mourvedre. Taste:- A very aromatic nose on fruits, butter, then a fresh and crispy entry and a fat palate finishing on freshness and fruits well balanced.LOW STOCKS. Varietal:- 60% Grenache and 40% Syrah. 1/3 aged in barriques for four months. Taste:- From a 30 year old low cropping vines. Selective picking. A nose of red fruit, nicely full of fresh fruit such as blackcurrant and redcurrant, slightly oaky in the mouth and a lengthy finish on softened tannins. Varietal:- 75% Grenache, 15% Syrah and 10% Mourvedre. Taste:- A distinguished wooded red with a time in barriques following fermentation. With roast of grilled red meats and medium to strong yellow cheeses. Ready for drinking now. Taste:- A Gigondas of distinction, 40 year old vines growing on chalk and clay at 300m, blend of Syrah, Grenache Mourvedre and Cinsault, vinified in concrete tanks and aged in old barrels 9 to 10 months, can age another three years or be enjoyed now, recommended with red meats, duck and cheeses. Taste:- Grenache, Cinsault and Carignan make up the rosé, which is made by way of saignée, a rosé that is fabulous for all your summer dishes and goes especially well with Thai, Malay and Indian cuisine. Varietal:- Clairette 60%, Grenache 40%. Taste:- A generous and rounded wine with scents of jam lightly spiced with vanilla, and a rich palate that ends in tastes of ripe peach and pear. Terroir blessed by warm sun and the calming influence of the Mistral wind, the 3.5 ha estate in Côtes-du-Rhône rests on rich soil, argillite on a bed of pebbly sand. The grapes grow on terraces, facing south south west. Excellent as an apéritif, or with Potée Lorraine, de l’Osso Bucco, blanquettes, cooked fish, and try it with a dry goat’s cheese, even after the savoury courses, with fruit cake or other puddings. Varietal:- Grenache 40% – Carignan 40% – Cinsault 10% – Syrah 10%. Taste:- Pleasantly fruity while dry in sugar level, and wafting scents of raspberry and blackberry. This wine is an instant favourite of those who have not tried French rosés before, and goes with all light dishes. See the white for soil description (above) .Mostly picked by hand. Cold maceration followed by fermentation at 16°C. Three months in metal tank.Take on a picnic, drink as an aperitif, barbeque, fish, Asian cooking, white cheeses and soft pâtés, puddings with fruit or chocolate in them. Drinks best at around 10°C. Varietal:- Grenache 60% – Carignan 30%, Counoise 10%. Taste:- A blend of Roussanne, Grenache and Viognier from 20 year old vines. Fresh white fruits on the palate and scent of white flowers on the bouquet. Served as an aperitif, also with asparagus, fish, white meat with creamy sauce, veal, seafood, risotto and salad. Drink now. Taste:- The winery originates from the Hermitage of St Cecilia on the pilgrimage route to Compostella and the current cellar was built in 1800. A simple wine using Rhone varieties, best drunk in its youth with meats and yellow cheeses. Taste:- A robe of sunlit gold. The ageing in new barrels brings some touch of nuts and pastry sustained by the acidity of the Roussanne. Taste:- Intense peony colour. The bouquet reminds one of a red currant tart with cream of vanilla.The palate, backed up by a good acidity, expresses notes of lychee, raspberry with a hint of fresh hazelnuts. Very nice with Asian and Indian cuisine. Varietal:- 60% Syrah, 20% Mourvèdre, 20% Grenache. Taste:- Deep garnet robe. It smells of ripened red fruits, but almost spices from Provence and grey pepper. There is a good balance between fruits, tannins, wood, spices with some taste of game and leather. Decant it for an hour or two before you serve it with roast meats, barbeque or with spicy food. Taste:- A wine of pure golden colour, like a diamond in its lucidity with flashes of golden light. The palate is complex with pear, rose and tropical fruits like lychee and mango. As an aperitif, with melon, with foie gras, puddings of the fruit sort (such as strawberries), Middle Eastern pastries, blue cheeses, dark chocolate. Taste:-Lively and rich blend of Cabernet Sauvignon and Merlot, displaying the characters that made the earlier vintage such a favourite with our customers. For roast beef and mushroom dishes. Taste:-Another elegant Merlot from a region in the vicinity of Bordeaux, displaying juicy and seductive aromas of plum and velvety tastes. Taste:- Silver Medallist in Bordeaux, this wine has firm tannins and a pleasant smell and taste of cassis and plums and would be very nice with a veal cutlet or a beef casserole, or a vegetable gratin. Taste:- Has a beautiful deep yellow colour, a complex and very rich acacia blossom honey nose and pleasant gingerbread. Long and rounded character without excessive heaviness. Serve very chilled. It goes very well with foie gras, blue and other strong cheeses, and puddings containing fruits or chocolate. Taste:- Very dark purple colour, with medium to strong taste of very ripe fruit, no oak. Perfect with mushrooms or white and red meat dishes, such as steak béarnaise. Taste:- More complex than Fruit Noir, but with the same charm of unoak very ripe fruit. Suitable for red and white meats, and dishes such as Cassoulet. Taste:- Dark cherry colour with flashes of ruby. Nose has spices and pepper which stretch out over pleasant smells of deeply ripe red fruit. Unctuous mouthfeel and harmonious aftertaste. For white and yellow cheeses, or roast chicken or duck, or other barbequed meats. Taste:- The inspired blend of Malbec and Merlot has a deep colour tending towards elegant black. Its nose of black fruits and spices, its smooth taste of Mulberries and strong tannins indicate a wine that will live for 8 to 10 years. Perfect with wild boar, game and goat cheese. Taste:- Bergerac sec 2010″ is a fresh tasting wines, showing with elegance and finesse a nose of citrus, mango, pineapple, peaches, and white flowers. The palate is supported by abundant acidity to which the wine owes its freshness. Wine to drink on a whim, by itself or with simple dishes or an entree of raw vegetables and dip, seafood etc. Taste:- This “Bergerac Rosé 2010” is a very friendly wine for your times with friends. For an apéritif in fine weather, or to accompany an outdoor picnic. Lunch on the terrace or barbeque in the garden. Produced by skin maceration which gives it a rounded mouth and a nose with a bouquet of various red fruits (strawberry, cassis and raspberry), and boiled lollies. Taste:- Bergerac Rouge 2010″ an ideal red to drink every day. It goes very well with our simple comfort foods at home. The dense violet red colour is very pretty, and the mouth full of fruit and roundness will make it a favourite of yours. Taste:- Bergerac Rouge 2008 élevé en fût de chêne” a red wine of character made best with best parcels of fruit on the estate, one third vinified in large oak barrels. Decant before serving to enjoy its best qualities. Taste:-Côtes de Bergerac Moelleux 2010″-there is a gentle shade of sweetness about this wine It has intriguing scents of mint but equally of peach, pear and citrus.. You can drink this wine at all times of days, fitting for many occasions: apéritif, entrée, certain salads, certain fish, a variety of cheeses, and puddings. Taste:- Unoaked version of the Malbec of high quality and some bottle age. Perfect with roast beef. Note that Chateau Armandiere 2007 has just been graded one star on the Guide Hachette 2010, an august French publication. Taste:- The wine shows a brilliant ruby red colour with hints of cherry. The nose, very intense, evokes a melted combination of red berries with spices. After a forceful initial impression at first sip, the mouth also manifests a great strength, but without aggressive tannins. Aromas of elderberry, apple and blackberry complete the whole, assisted by some floral scents of violet. This wine should be decanted before being served at 17 °C, with a terrine of duck and olives, caramelised beef cheek, a pudding with chestnuts. In season, will accompany wild boar tenderloin with pepper sauce. Should a boar not be present, try it with venison or a beef casserole. Taste:- Unoaked beauty from the vineyard at Quercy with ruined castle vineyard grounds and a charming family who own it. Wonderful smooth red, beguiling and seductive, like some Damson Damsel in one of the towers of the Cahors castles! Taste:- An exclusive handpicked and handmade Malbec red with superb concentration and balance; dark powerful fruit in a graceful minuet with French oak; you must at least try a couple of bottles. “Cahors Selection Gold medal at “The International Vinalies” 2008 ; Hachette 2009 and Gilbert & Gaillard Guides; Gold medal, Macon 2007; Hachette 2008 Guide and Gilbert & Gaillard Guide; Argent aux Vinalies Internationales 2009. Taste:- Tank samples overwhelmingly beautiful convinced us to take the agency, and earlier vintages we tasted in the mediaeval farmhouses of the estate confirmed the quality of this wine, made by the experienced family Lescombes. No oak but superb flavour. For all meat and cheese dishes. An intense purple colour, a complex nose of blackcurrant and raspberry, a “greedy mouth” as the French call it; dark fruit and smooth tannins. Taste:- Magnificent colour of deep red with violet flashes. A powerful nose of red fruits and rich oak scents. The palate reveals a wine of full body with oak supporting, luscious and smooth, the wine given that right touch of sweetness from barrel maturation. Taste:- A fresh and elegant nose with a wine of beautiful red colour. Mouth feel round, with a flavour pleasing and soft, both fruity and minty. An undemanding partner to lamb, chicken or cheese soufflé. Taste:- Aromas of plum and blackberry greet the nose with this 100% Malbec wine. Attractive freshness and lovely fruit, the palate offers vibrant acidity and firm tannins along with notes of mulberry, blackberry and slight earthiness. Taste:- The father of the family that own this estate, a lively 85 years old, likes this wine, Cuvee Prestige. I think he would drink it all if I had not bought it first! A lovely Malbec. Beautiful shimmering colour with purple ray of light. Powerful thoroughbred, the nose is full of black fruit, enveloped in rich wood. The mouth reveals a stout, powerfully structured, oily and sappy wine. The ageing in barrels gives a final touch of mellowness. 2 stars at GUIDE HACHETTE 2004, Grand Prix d’Excellence aux VINALIES 2004. Taste:- Thanks to the exposure to sunlight of its terraced vineyards, this wine bears flavours of red and black fruits, black currants, blackberry, raspberry, cherry, and strawberry that will charm you. Its warm and generous structure makes this wine is a perfect partner for the cuisine of Quercy Perigord: filet or conserved duck, of course but also grillades, charcuterie, terrines and truffle pates.. Fruity and hearty, 80% Malbec (Auxerrois Cot), 20% Merlot. Chalky clay hillsides and clay siliceous terraces. Can be kept up to 8 years in cellar. Fruity wine when young, red fruit aroma, blackcurrant, cherry, woodland fruits with a slightly spicy touch. Frank mouth, warm, rich in substance. 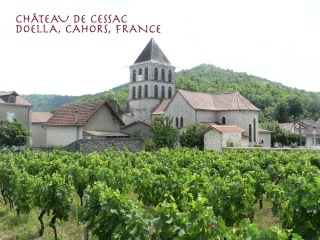 Taste:- According to legend, Tsar Peter the Great used wine from Cahors to soothe his stomach. In his honour, this wine takes his name (formerly Cuvée Réservée des Tsars). From fruit grown on our terraces and little slopes, this wine is the height of elegance in its perfumes or red fruits and the finesse of its tannins. Serve with red meats in sauce or grilled on delicate dishes lightly spiced. Taste:- A fruity wine, aromatic, to drink now. A wine to sip with family and friends at barbeques and picnics… Cabernet Sauvignon, Ségalin. A crimson colour, pleasant bouquet of blackberries, raspberries and a touch of eucalypt, strong taste, spicy tannins and a definite roundness. Worth decanting. Taste:- Jean-Michel creates this rose with the same Segalin grapes. The label has fascinating Tahitian designs! He has done a very fine piece of work. You can enjoy this as we did, sipping it with your grilled trout by the river. Taste:- The Polynesian heritage of the winemaker has delightfully surfaced again in the creation of this wine. Medaille D’Argent at the Concours International of Malbecs of the World. Vinification : Cold Macération before fermenting over 48 hours. Fermentation at 20 degrees in stainless steel with temperature control. Regular and daily remontages. Long maceration under stem with micro oxygenation. Into barrel at beginning of malo-lactic. French barriques for 12 months minimum. Regular ouillage.The colour is very dark, almost black. The deep nose opens out into a complex bundle of aromas with notes of cherry. A discreet and refine wood note evoking hazelnuts and spicy bread. On the palate, powerful and silky with clean and long lasting flavours. Much to be recommended for the winter dishes! Taste:- The senior partner of the Rieslings, highly selected fruit and intensity of flavour, with structure to match, permitting extended aging. For all serious devotees of the Riesling grape. The wine has grapefruit aromas. The palate is fresh and crisp when the wine is young. The acidity is balanced by plenty of body and structure with more or less exotic fruit depending on maturity and a silky finish. Wine pairing: Fish, lobster, poultry with sauce, fresh and processed cheeses. Age of the vines: 30 years. Taste:- Intense yellow gold colour. The nose is full, rich and exhibites flavors of apricots, yellow peaches and white flowers. On the palate, there is a remarkable harmony between fat, power and freshness. The main aromas are yellow fruits. Taste:- Limpid pale yellow colour. Profound nose mingling exotic fruit and white flower. Seductive volume and superb freshness enhancing a nice fruit complexity. Freshness, aromatic spiciness and pale colour. For aperitifs with dip, Asian food, fish. Taste:- Light yellow colour with green tints, this wine has a nose composed of white flower flavors. On the palate, the wine is fresh, delicate and reveals a nice minerality and white flowers aromas. Perfect for fish or Indian or Asian food. The Sohler brothers at their very welcoming cellardoor and winery in the village of Scherwiller. Taste:- Beautiful colour, nose of cherry, fruity character. For rabbit, poultry, mushrooms, pates, terrines and fondue. Taste:- Fresh and light white wine, dry. This sylvaner is vivacious, fine, and easy to enjoy before dinner or with fish, spicy food, grilled sardines, mackerel or raclette. Taste:- This is a dry white wine. Rich, full bodied, with a long finish; this wine has a smoky bouquet, with a fine roundness. It’s a great wine for keeping if you wish. Excellent with Sole, Monkfish, Exotic fish recipes, Spring Rolls, Chicken or Fish tajine. Taste:- This is a semi, sweet white wine. This Gewürztraminer is rich, with an exuberant powerful, lychee, exotic fruits. Its deep bouquet displays rich aromas of fruit Sumptuous with exotic savoury dishes (spicy dishes, sweet and sour dishes, especially Chinese dishes, or mild curry, Tandoori chicken) and soft cheeses and washed rind cheeses (Stilton cheese…) as a superior aperitif and, naturally, with dessert. Taste:- The first Vintage of the Alsace Grand Cru Frankstein of our estate is now available. This Frankstein has won begining June 2009, the Gold Medal at the competition of the Gewurztraminer of the World! It’s a great white sweet wine, with a full character, and fifteen years of keeping; for aperitif, foie gras, and spicy dishes. 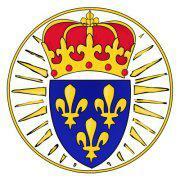 Taste:- The vendanges tardives (late harvest) is the highest quality of Alsace wines. This Gewurztraminer Vendanges Tardives, vintage 2007, has a wonderful nose of honey, spice, and crystallised fruit. In the mouth, it presents an overmaturity character, with a beautifull and fine sweetnes. After the gold medal at the Vinalies International for the vintage 2004 and 2005, and after the big gold medal at the Paris’s fair in 2009 for the vintage 2006, this Gewurztraminer Vendanges Tardives 2007 has won the Vinalies Prize in June 2009. to drink with aperitif, foie gras, sweet moments. The clear distilled fruit spirit Marc de Gewurztraminer is derived from the solid particles of the grape, that is to say, the skins and pips which have been fermented before distillation, strictly done by the appellation laws. Very fruity, excellent to complete an Alsatian dinner, served with a lemon sorbet or taken simply as a digestif. Distillation of William pears yields a fruit spirit, very perfumed with fine aromas of pears. It is the best known of Frey Sohler’s fine Eaux de Vie. A mirabelle is a little plum typical of the region of Alsace and Lorraine, round yellow, with light red flecks. It is a very sweet fruit which also makes up the famous Tarte aux Mirabelles, about which Alsatians drool. Its spirit is very refine giving an impression of sweetness on the palate, but the spirit itself is quite dry. A plum often found in Alsace, the quetsch is violet in colour, deliciously sweet with firm flesh and gives us an excellent Eau de Vie which is drunk as a digestif. Varietal: – 100% Pinot Noir To the eye, they are richly coloured – crimson at first then with age, shading towards dark ruby. To the nose, they offer at first a basket of small red and black fruits ( Strawberry, cherry, blackcurrant, and blueberry) later evolving into cooked prunes, peppery notes, and notes of gameyness, forest floor, moss and mushroom. Varietal: – 100% Pinot Noir Dark red cherry. Red fruits with a tone of blackcurrant. Long finish with tannins. Varietal – 100% Chardonnay Strong yellow. All the citrus fruits, exhibiting more aromas and tastes of dried fruits after 2 or 3 years. All the flavour comes from the Chardonnay grape, long in the mouth without too much acidity. Varietal – 100% Pinot Noir Raspberry and blackcurrant with a tone of toast. Varietal: – 100% Chardonnay Taste :- Brilliant yellow-greenish colour, with white flowers, pineapples and almond flavours. Well-balanced in mouth, with a nice acidity and minerality. Good ending. Aperitif, seafood, fish, white meats and selected cheeses. Taste: Similar to a Pinot Noir but with more notes of spice, herbs and raisins, the Gamay is ideal as a luncheon wine or with plates of cold cuts, quiches and white cheeses. Taste :- Domaine Chavet AOC 2008 Macon Rouge 2008 The Menetou-Salon rouge, from the elegant Pinot Noir variety is ruby-coloured with a ripe-cherry and plum-scented bouquet.Supple and elegant, it is among the very few wines that you can equally enjoy whether you taste young or after a few years’ stay in your cellar. After having spent 3+ years in the bottle, it will astonish you when combined with the most prestigious dishes. Taste: – An explosion of scents! New vintage from Domaine Cauhape, the Geyser embodies the five varietals making up the appellation of Jurancon. The nose has a great complexity and freshness that speak of citrus and tropical fruits on the background of scent floral, peppery and aniseed. In the mouth, it is immediately powerful, aromatic, fresh and open, and finishes persistently and generously. Terroir is argilo silica expose to the South east. Keep five years. Fruit is handpicked at the beginning of October. Vinification Eraflage followed by 12 hours of skin maceration. After fermentation, the wine stays five months on all its lees. Serve as an aperitif, with shellfish and crustaceans fillets of fish in citrus sauces. Taste:- Pale gold, with reflections of green. The first sip is supple, and there follows a richness and long finish and fullness that make this wine so well balanced, unlike many new world Sauvignon Blanc. It gives off lovely aromas of floral, citrus and green gage. Serve with grilled fish, oysters and scallops, crustaceans, white meats and goat cheeses. Varietal :- 35% Merlot, 30% Fer Servadou, 25% Syrah, 5% cabernet sauvignon 5% cabernet franc. Taste:- Deep red colour, with relections of violet. A strong smell of very ripe cassis and raspberry, spices and liquorice. The taste is of chocolate and dark fruits in an instantly perceptable harmony. You should serve this with a mature cheddar, sausages and meats both red and white. Taste:- A light golden colour with sparkles of green, the aroma of little green apples and the taste of green apple and fresh fruit. Serve as an aperitif, with crustaceans, other seafood, or with a pudding course. Taste:- Lighthearted Label, half old vine Carignan, with minority parts Syrah, Grenache and Mourvedre.Grown at Boutenac in the Corbières and fermented in separate tanks with no oak. Lightly filtered only for depth of flavour , then assembled as a blend. Tasty fruity bouquet of ripe red fruits, a delicious wine perfect for tapas or white meats.Silver Medals at Decanter World Wine Awards and International Wine Competition. Taste:- Grown on Boutenac’s argilo-calcareous soil of the Languedoc with aeolian sands present, ideal ground for these 50-70 year old vines to yield a glorious unoaked red wine that has rich round fruity flavours with spice, Mediterranean herbs and prunes in the background. Can keep five years, try with hearty cuisine such as a cassoulet or roast beef and vegetables, or a platter of white and yellow cheeses. Silver Medal at Concours Mondiales, Brussels, Bronze at Decanter World Wine Awards, London. Taste:- Half old vine Carignan, one quarter Syrah, with minority Mourvdre and Grenache, this wine underwent maceration for about three weeks and its Syrah part was fermented in barrique and spent four months in barrels then joined the other tank-fermented grapes in this blend. Fine well integrated tannins and a generous mouth, lots of personality and balance. The 2008 vintage won Gold at Concours de Grands Vins de France, Macon and at Concours Mondiale, Brussels. Taste:- Grown at Boutenac entirely from a plot of Mourvedre vines over fifty years of age whose soil is particularly sandy and ideal for lovely fruit. Currently under conversion to fully organic cultivation. Nine months in French oak barrels new, one year and two years of age. Rich, delicious scents and tastes of ripe red fruit, slightly smoky, silky and velvet tannins. An opulent wine to serve with roast meats and strong cheeses.